Spray 5- to 6-quart slow cooker with cooking spray. Rinse green beans and corn with cold water to separate and partially thaw. Mix green beans, corn and remaining ingredients in cooker. If you can't find the canned diced tomatoes with roasted garlic, use two 14.5-ounce cans of plain diced tomatoes and add 1/2 teaspoon garlic powder. 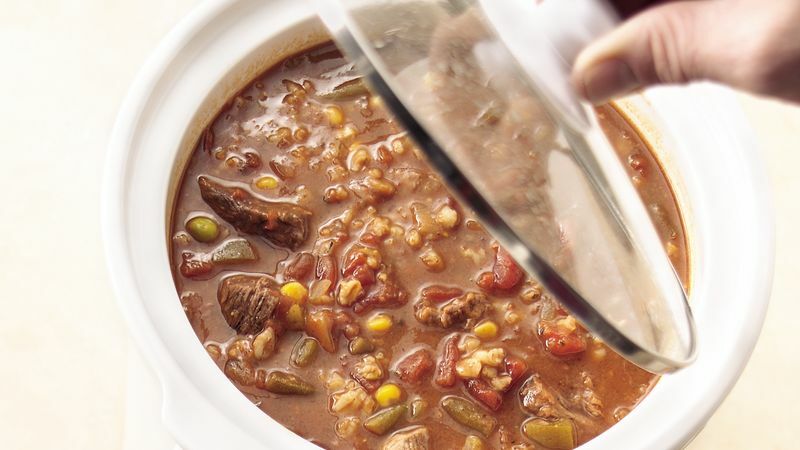 Select lean stew meat, and trim any extra fat before adding it to the soup. Top this soup with a handful of herb-flavored croutons and a little shredded Parmesan cheese.